Pipedrive and Salesforce are popular CRM software that have been adopted by businesses; small and medium to large enterprises. If you are in the market for a CRM solution to strengthen your sales process, this post will help you take an informed decision by highlighting some of the key factors based on which, CRM software (for small business) should be selected. Ease of use is important for any modern app. Traditionally Saleforce has been lagging in this area, However their latest lightening UI provides a viable solution in terms of UI. When you log in, the dashboard presents wide range of report widgets that provides a bird’s-eye view of how the revenue. Sales reps can also view real-time summaries of their performance and customer data. The dashboard can also be customized to show you data related to wide range of key metrics — from sales quota and pipelines to key opportunities, leaderboards and more. There is a simple navigation at the left hand side. Each tab is separated into the categories, such as Home, Contacts, Accounts, Leads, Campaigns, Opportunities, Forecasts Files and more. As part of the dashboard’s customizability, you can also reconfigure each tab or add your own as per your preference. Some of the areas such as pipeline management and deal settings demand higher learning curve as there are multiple steps involved in the process. Limitations: A big concern for small business owners is that there are additional costs associated with using Salesforce beyond its core capabilities. For instance, third-party apps that require additional licenses or accounts, such as Data.com, aren’t part of Salesforce’s pricing plan. You’ll end up paying for those services on top of the already expensive Salesforce subscription. For small businesses, Salesforce’s biggest strength is also its weakness. Because of the robustness of the CRM app, it can be a good choice for larger businesses and at the same time it can be overwhelming for small companies that don’t need such an exhaustive software solution. Given below is the pricing of Salesforce which limits usage of feature and differentiates in terms of customer support apart from locking the customer for a year. Pipedrive is known for its simplicity and usability. The on-boarding comes with a guided tour where the app prompts you to perform various basic activities like deal and contact creation. Although it can be considered as a good sales pipeline management tool, it lacks holistic approach towards the needs of a small business. Pipedrive is based on sales pipeline and the activities are closely tied with deals to ensure that the deals move from one stage to another. You can manage sales pipeline and contacts as well as use the data import/export functionality. Integrations: There are 80+ third party apps integrated with Pipedrive which portrays the extent of dependency on other apps in order to set up the business process. Email tracking: Email tracking is quite important for salesperson — it allows your team to keep track of the conversation for quick reference while carrying out sales activities to close the deals. TeamWave is built by a small business for small businesses worldwide. Our mission is to provide a unified platform for collaboration, sales & marketing to small businesses at an affordable price. 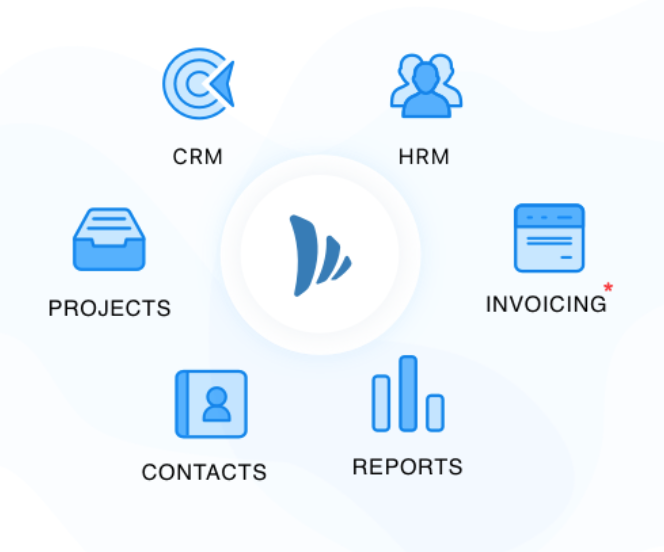 TeamWave offers a complete software suite of essential apps required to run a small company, i.e., CRM, project management, people management & more. Visual sales pipeline which offers pre-built sales stages along with option to configure as per your company’s business process. Robust contact management functionality along with import/export tool. Goal set up to help your team achieve their sales targets. Important files can be copied from deals to projects (example: requirement document) with a few clicks. This comes handy when you commence project delivery after winning a deal. Finally, all these apps are not differentiated based any tiered plan. The pricing is simple and straightforward — all the users get to use all the features and apps (pricing is only based on the number of users). The annual subscription plan comes for $3 per user per month and monthly plan comes for $4 per user per month. TeamWave delivers essential software suite required for any small business while ensuring robust set of features and superior user experience. And all this comes at a fraction of the cost you’d pay for the other alternatives.